Hello everybody! Today is my last day here at the farm (sad face) I was honored to be asked to Guest Design and I had an absolutely fantastic time doing it! I feel like I saved the best for last! Here is my project using the Hello Dollie-Dollie and Kitty Stamp Set. I thought it would be so cute to create a card and matching gift box to go with it! I used alot of paper flowers and shabby papers on this project. The sentiment and the second Kitty are from he same stamp set. Your Next Stamp: Love and Smiles Card and VIDEO! I just love this simple little card, its so sweet and delicate, perfect for a baby card! Hello everyone! Its my third week Guest Designing for The Greeting Farm! Wow time flies! So for my project to today I used the ultra cute Oliver and Amelia-Lovey Dove. I love all Greeting Farm stamps, but I have a soft spot for Oliver and Amelia. So I made a sweet little gift bag with the lovely Amelia, the "Sending You Smooches" Sentiment is from the same stamp set. I also made a video on how I colored her up! I also have a video on my YouTube channel on how I colored op Oliver from this set as well, you can find it Here. Thank you so much for popping by! See you next week! Winter Scene card and Video! Hello Everyone! Today I have a winter card to share with you! I know its only September but who has time to make Christmas cards at Christmas? I used the Lovely Roberto's Rascals "Honey" for my card. Isnt she a beauty!! She looks so ready for the cold. I used the birch trees stencil from the September release to make the scene behind her, plus a lot of other CC Designs goodies! I'm loving those enamel dots! I made a process video of how I made the card as well. If you have any questions about how to use the embossing paste with our stencils, you can check out how I do it in they video, I also show you how to create a cloud background. I Hope you enjoyed this wintry card! I just love Brigitta, she is the cutest! I created the shape of my card using my Silhouette Cameo. All the flowers are from Wild Orchid Crafts, I also used some other CC Designs goodies the links will be at the bottom of the post. I also did a start to finish coloring video tutorial for you! Here is the video, it would absolutely make my day if you gave the video a thumbs up and subscribe to my YouTube channel! Sometimes I put videos up on my channel and not on my blog! I don't want you to miss out! New Doodle Dragon Release at CC Designs!! Hello everyone! We have five new Doodle Dragon stamps today at CC Designs! I made a cute little treat bag with "Pumpkin Friends"
Aren't they just the Cutest little Buddies ever! I used some other CC Designs goodies as well there will be links to the Pumpkin Friends and all the CC Designs products I used below. Thank you so much for popping by and have a wonderful day! Hello everyone! I'm so excited to share another TGF creation with you guys! Today I made a Cascade Card featuring Dressy Edward.. I made the card dark and brooding because it suited him so well. The card shape and layers are cut with my Silhouette Cameo. The "Your Charming" sentiment is from the TGF "Ever After" set. Dressy Edward was colored with my Copic Markers and fussy cut out. I hope you enjoy the card ad much as I enjoyed making it! Hello everyone! The Paper Nest Dolls had a new release earlier this week! And I totally spaced and didn't show you my creations with them! You can find the whole new release Here I made and a card and a tag for the release first the card. These two adorable creatures are called "Holiday Friends". I really like to do pinks at Christmas, I also like the traditional colors... but sometimes its fun to mix it up. Go pick up some off these cuties! You will have a blast with them! TGIF everyone! I have been trying to find my card style for a while now... and the truth is I didn't find it.... well not specifically... I like bright things... and a nice balance between CAS and crazy over the top. Dont get me wrong I LOVE both those styles, but they are not where I shine. So today I thought I would show you a card that encapsulates what I feel is MY style. 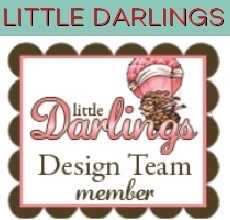 The stamp I used is "Wings" from the Dollhouse collection that Little Darlings Rubber Stamps Carries. You can find her Here. Bright... not to simple... not over the top.... uniquely me. So I guess I did find it in a way! I used Copic markers for this stunning butterfly girl. Thank you so much for popping by today and everyday, I truly appreciate each and everyone of you. Hello everyone! I hope you are having a wonderful week! Today I have a fallish thank you card to share with you. I always need thank you cards. I kept this card fairly simple, only Maja papers, some fabulous Wild Orchid Crafts flowers, and of course some CC Designs goodies. Here is the video for you guys! I would love for you to subscribe to my YouTube channel, I have alot more videos planned, and I may not post them here, I wouldn't want you to miss out!